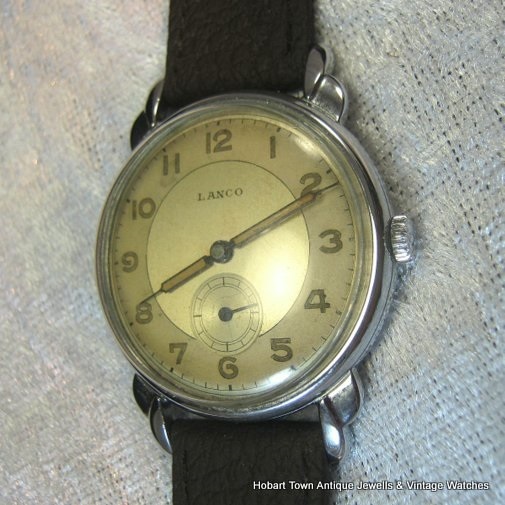 What a Stunning Langendorf Lanco 1940’s Sub Seconds ww2 Gents Watch this one is. 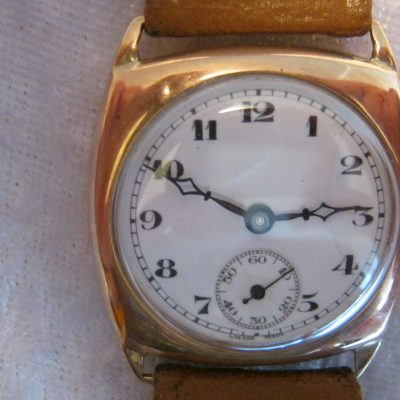 A Quality Classic ww2 period dress watch which oozes style & class ~ at a great price!. 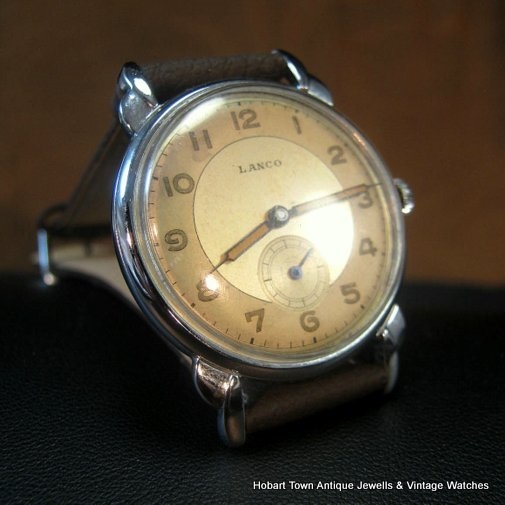 This Stunning Langendorf Lanco 1940’s Sub Seconds ww2 Gents Watch is a fine quality ww2 period vintage watch. 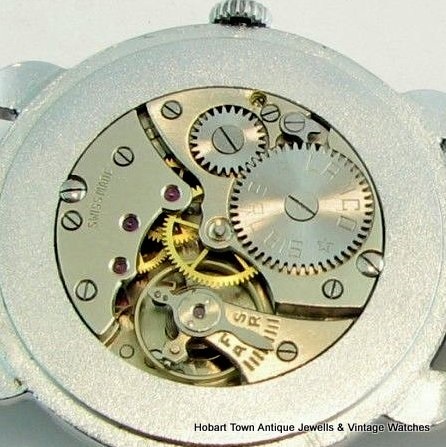 It also happens to be a near perfect design in all aspects , that all watch makers aimed to design & produce …….. with few succeeding. 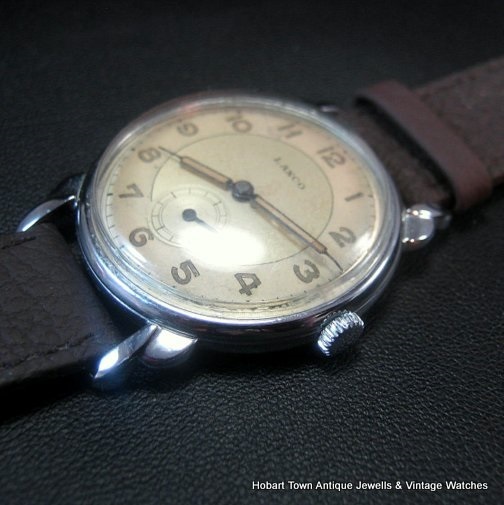 I say that in relation to the ‘golden years of wristwatch design’ c1910 – 1950. 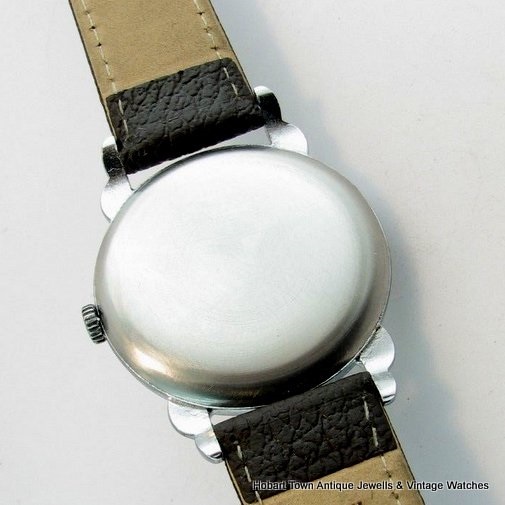 A full size gents watch at approx; 34m wooc & with those Amazing lug’s and & relatively narrow bezel , this Stunning Langendorf Lanco 1940’s Sub Seconds ww2 Gents Watch presents as a 35m+ watch. 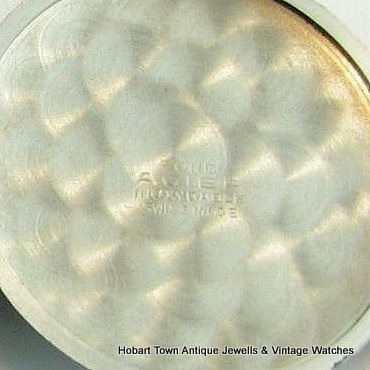 The case has been cleaned/restored and presents as near new original condition. 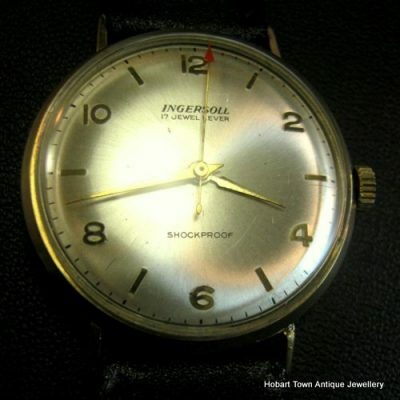 An handsome two tone dial , which remains in 100% ‘untouched’ / original condition. 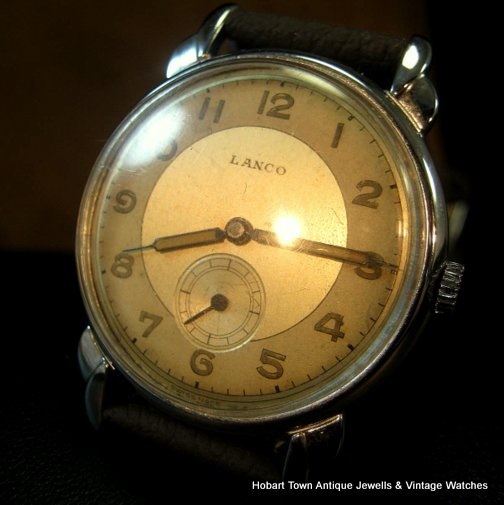 Original & appealing pencil hands , small sub seconds dial with original sweep hand and LANCO below 12 ~ this is one stunning plain uncluttered dial , some would say ……. of restrained class & style. 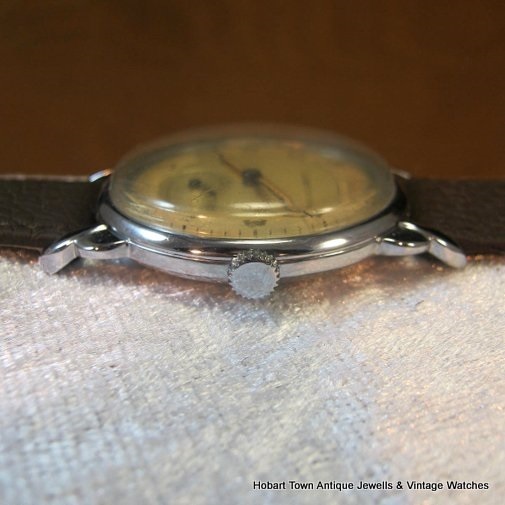 The 15 jewel Langendorf movement is in mint condition and running beautifully. 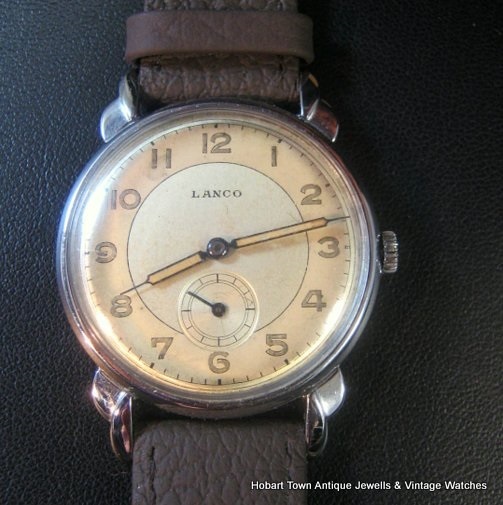 Lanco was one of the many arrows in the Langendorf quiver of fine watch names and was first registered in the beginning of 1913 by the Langendorf Watch Co; – who had been manufacturing fine quality watches / in house movements since 1872/73. 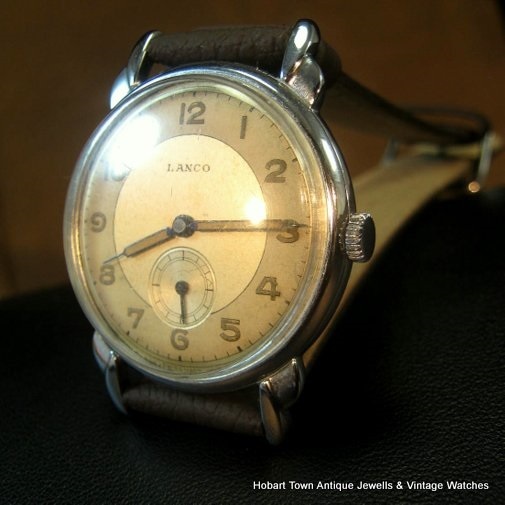 The Stunning Langendorf Lanco 1940’s Sub Seconds ww2 Gents Watch is an absolutely beautiful watch & a true design classic portrayal of this iconic overall design & one that will look fantastic on either a man’s or woman’s wrist! 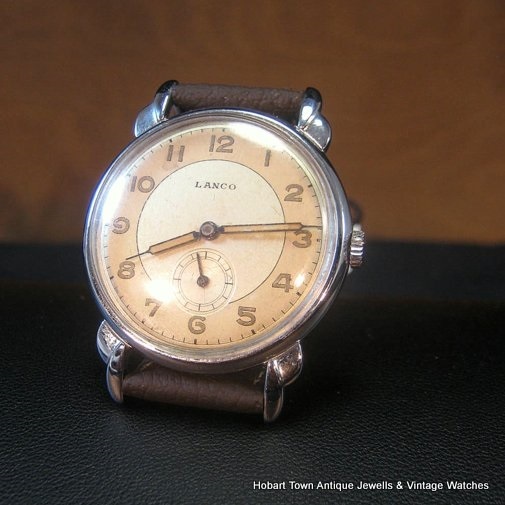 The twist lug’s are possibly the best portrayals of this style that I can recall seeing & have a major input into the overall beauty , style & appeal of this Stunning Langendorf Lanco 1940’s Sub Seconds ww2 Gents Watch ! 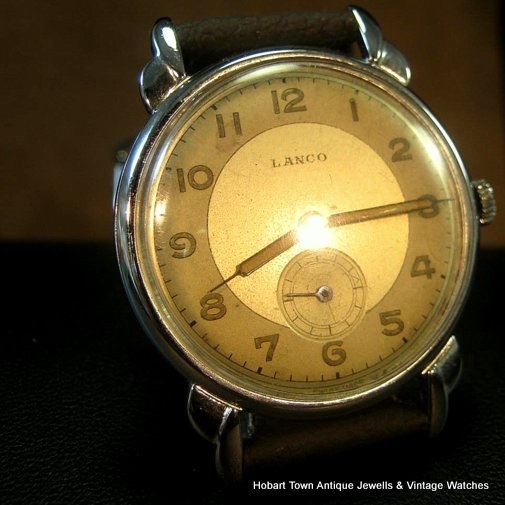 Probably the very best non chronograph Lanco that I have seen and although they did not produce 100’s of fantastic different overall designs , they certainly made dozens of fantastic designs , much more than can be said by many significant brands on the vintage market today. 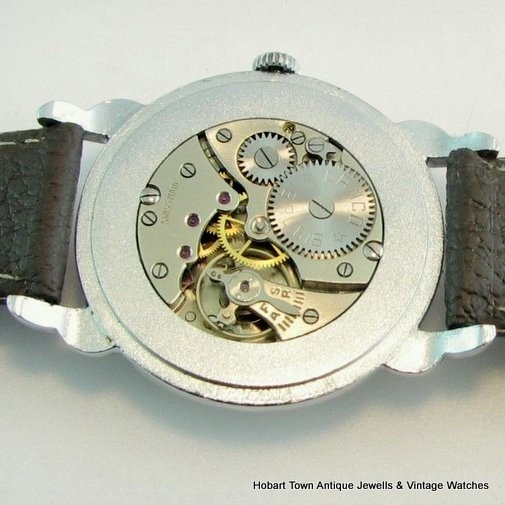 Fitted with a new 18m strap that suits the two tone dial well. 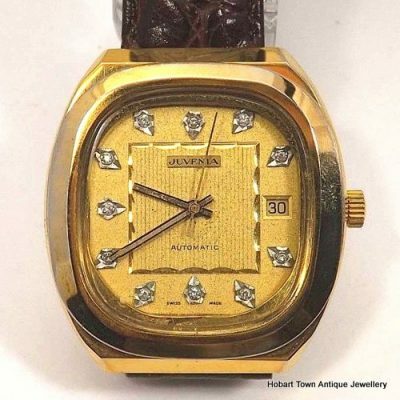 Being sold at a genuinely good price for the quality , rarity & condition. 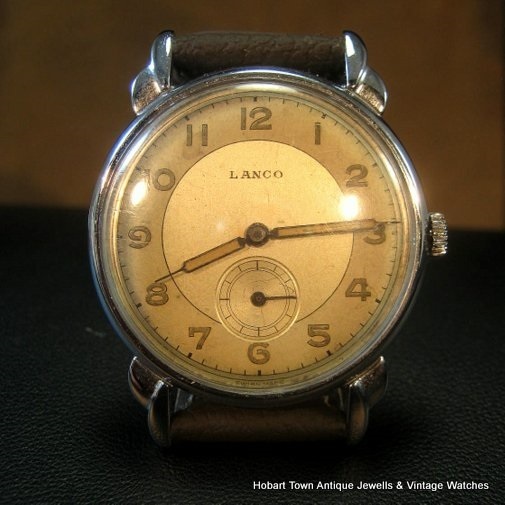 If you have any interest in this Stunning Langendorf Lanco 1940’s Sub Seconds ww2 Gents Watch Or if you have any questions to ask – please email and we will get back to you promptly.